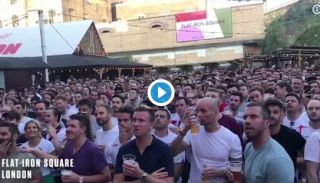 Just look at the scenes around the country as England took a 1-0 lead against Croatia in tonight’s World Cup semi-final. Fans are absolutely loving the prospect of football coming home this summer, with Gareth Southgate’s side looking like causing a real shock in Russia. A goal up against Croatia, England could be heading for a final encounter against France this weekend, with Les Bleus winning their semi-final against Belgium yesterday. This is what it means to the fans at home, with beer absolutely flying all over the place thanks to Trippier’s superb goal!